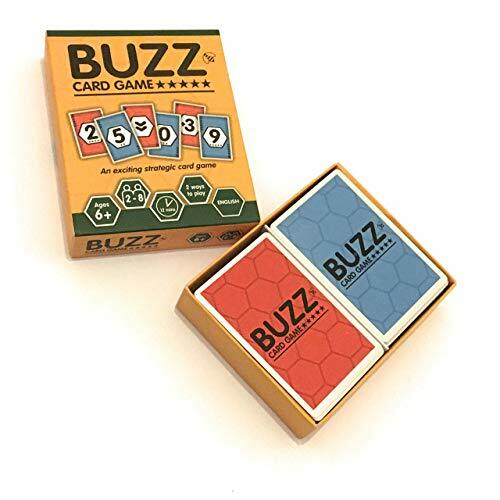 2 GAMES in 1: Buzz Card Game has 2 levels of playing - Easy and Strategic. Start with the easy level and then take the challenge with the strategic level. THE FUN: Buzz Card Game is easy to learn and play. Provides great entertainment for family and friends. Use the blank cards to create your own wild cards or house rules for more fun. EDUCATIONAL AND LEARNING: Kids can easily learn numeracy and also learn strategic moves. Helps with counting, concentration, follow other player's turns and capture the sequences. HOW TO PLAY: Each card has a ranking. Play a card ranked equal to or higher than the last card. Use the wild cards where possible. The player with no cards in hand wins the round. THE GAME: Age: From age 6 and up. Players: 2-8 players. Game duration: 12 minutes for the easy level and 20 mins for the strategic level. Language: English. Contents: 144 cards, Rules for both easy and strategic level. Premium quality cards and box. 6 Suits - The Playing Cards Revolution – with 6 Suits of 9 Cards - Play All Your Favourite Playing Card Games and New Ones in a Fun New Way with This Poker Sized Card Deck for Kids and Adults. GEMTRIX CARD GAME | Card game for kids, children, teens, adults, families, boys or girls. Card game perfect for camping, vacations and game night with friends. 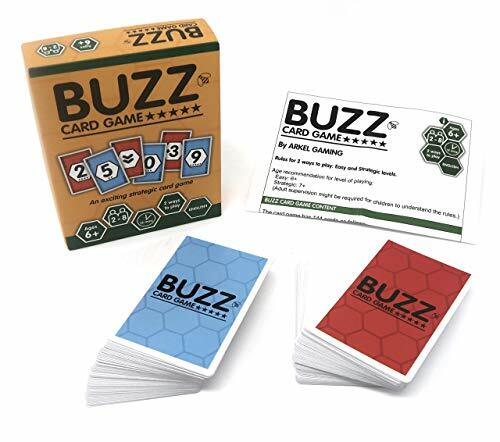 Buzz card game is here to boost the social interaction between kids, family and friends. 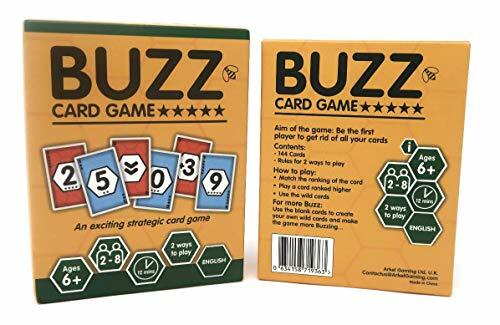 Buzz Card Game is a fun and strategic card game. An easy to learn game with two levels of playing: easy and strategic. Kids will love the easy level and then move on to the strategic level for more competence and challenges. All cards are handheld and laminated on both sides which offers a premium protective layer for the print. 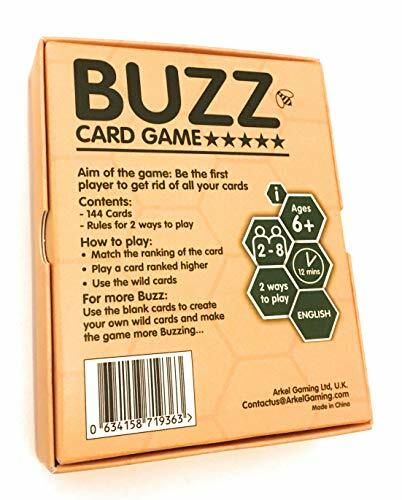 Buzz Card Game is a complete box of entertainment and eye-catching coloured cards which offers an energetic and vibrant mood for social interaction. A never-seen-before card game that brings friends and family together for a great laugh. Buzz Card Game can help improve the memory for kids, exercise your mind and speed up your responses and escape from stress. Great card game for travelling, holiday, house parties, family time, pastime and leisure time. Have fun with friends you can see face to face. 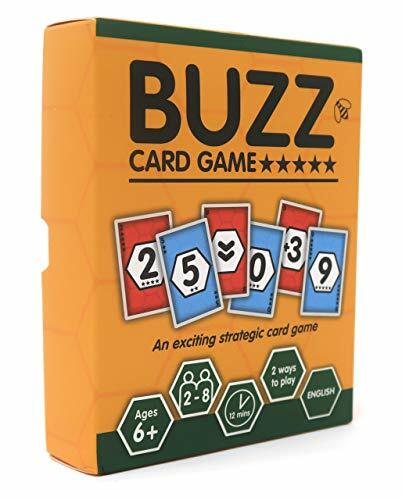 Buzz Card Game provides the best interaction with your family and friends. The first player with no cards in hand wins the round/game. The game can be played as a one-off or on a point based system where the first player to score 400 points wins the game. The players need to match or beat the ranking of the last card played. The game offers two levels of playing: easy and strategic. Use the blank cards to create your own wild cards/house rules and make the game more BUZZing.